Enjoy the simplicity of Black Stripes with a hint of Red as you bake, craft or garden together. 1 x Boy's Apron (as a general guide our Kid's Apron fits most 3-10 year olds). 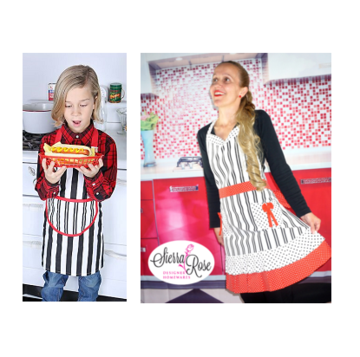 Both aprons tie at the neck and waist and are made of 100 percent Cotton.